Over the past decades, museums and heritage sites have been experimenting with various technologies to prolong the experience beyond the on-site visit. The most typical way to do so has been through museums web sites, but visitors rarely consult the museum website after the visits and the museums website often do not encourage these visits (Larson & Sincero, 2005). More recently, museums have promoted digital or electronic bookmarking as a way to extend the museum experience. SmartCard (Hornecker & Stifter, 2006) is a card that visitors could buy in the entrance of the museum and allowed them to collect objects or self created data (in this case pictures and videos) in a ‘digital backpack’. The tool Rememberer (Fleck et al., 2002), a ubiquitous system deployed at Exploratorium for capturing museum visits, enabled the visitors to collect or ‘remember-this’ objects using an RFID-equipped wristband, and read more detailed info about them on personalized web pages from home. Besides the traditional tour features, Multimedia Tour (Wilson, 2004), a guide application developed for the permanent collection at Tate Modern, provided visitors the option to bookmark their favorite objects during their visit. Myartspace (Vavoula et al., 2009), a service on mobile phones supporting the process of inquiry-based learning, allowed visitors to collect objects by typing in a two-letter code; after the visit, visitors were able to retrieve the bookmarked information on the Myartspace website. Despite the great potential of bookmarking, the systems developed to date have reached only a specific and limited audience, and there is a very little evidence that they actually help prolonging the experience beyond the on-site visit. Except for few successful cases, such as the MultimediaTour and Rememberer, with around 40% usage, for the majority of the projects the click-through rate is below 10% (Filippini-Fantoni, 2007). What this suggests is that we have not yet been successful in developing technologies for capturing and sharing museum experiences that are widely accepted and used. The issues do not lie only on the capturing and sharing side, but also on the receiving/consumption side. The expansion of Internet-based and mobile technologies has the potential to help intergenerational communication and to help families to keep in touch. However, there are barriers to use of the new technologies for older adults, and some of them are evident: aesthetically the new technologies are designed for younger adults and their features are difficult for elderly relatives to understand. The difficulties that they experience while using new technologies have been attributed to many factors: natural decline in cognitive abilities (Fisk et al., 2009), lack of interest (Coleman et al., 2010), and problems with user interfaces of the devices (Kurniawan, 2006); nevertheless one factor that has received relatively less attention is embedding familiar everyday analogies into product interfaces, or the use of metaphors. Interactions with digital interfaces make sense only for people familiar with digital products, whereas older adults, who are less likely to be accustomed to electronic products, are having difficulties using such complex product interfaces (Garrett, 2010). It is clear that if we are to develop technologies for capturing, sharing and consuming museum experiences that can be widely accepted and used by individuals of different abilities, more attention should be given to the visitors, specially in their relationship with the technology and how this is affected by the context of use and by their own needs and abilities. The approach we took in this work is based on identifying and validating, through a set of user studies, a series of metaphors and designs at increasing levels of “richness” both in content shared and degrees of interaction. 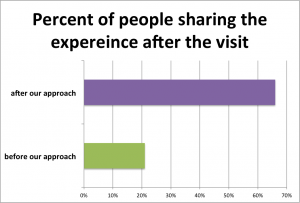 Throughout, both the sharing effort and the “invasiveness” of the technology with respect to visits that are not shared was maintained at a very low level. This approach, unlike others in the literature, is not based on virtual reality or rendering of museums so that they can be visited remotely, nor it is based on synchronous and continuous interactions between visitors in the museum and relatives at home (such as an audio/video link). This is technologically not difficult, but in our experience it is challenging both from the perspective of the elderly (it is cognitively difficult to consume content in this way) and from the perspective of their relatives visiting museums, as it is very “intrusive” in their visit. The latter aspect is often neglected but is crucial: sharing occurs only if it provides an emotional reward with relatively little effort. 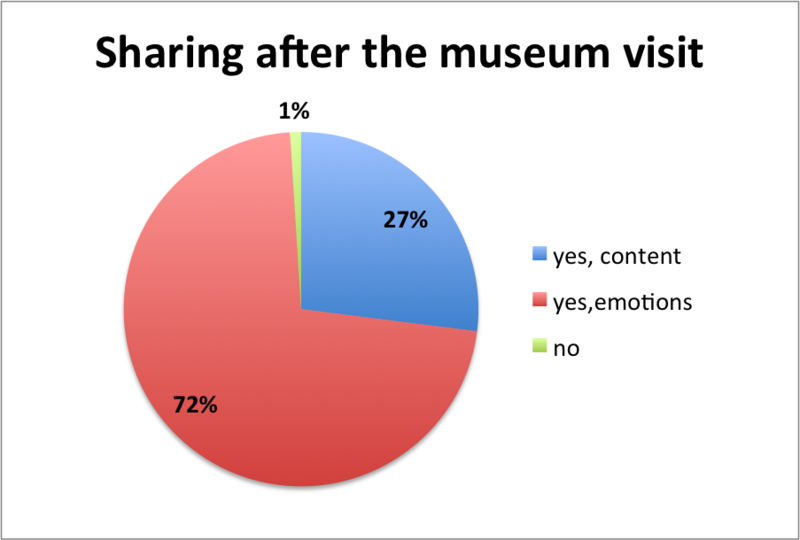 This paper is structured as follows: we first show the results of the study where we examine how and how much of their museum visits people share today. Next, we present the system we developed, the results from its usage, and the user study where the booklet was tested with older adults. We end with a discussion of the ongoing work in which we are trying to achieve the next level of interactivity via ‘dramas,’ where groups of visitors (e.g., a group of friends) are taken through a small narrative when visiting the museums to increase their enjoyment and stimulate interaction. To investigate the activity of sharing museum experiences in a traditional museum setting and to incentivize the design process we used an ethnographic approach based on semi-structured and structured questionnaires. We were interested to find out what, how and how often people share after their museum visits today, and the levels of use of the current Internet resources available in the museum. We performed 207 face-to-face interviews in a Museum of Contemporary Art (MART, www.mart.tn) in the period from 23 to 24 April 2013, and extended this data with a total of approximately 307 face-to-face interviews in a natural science museum (catering to an audience of mostly families and schoolchildren) (Kostoska et al., 2013). About 55% of the visitors were young couples, while the others were mainly either groups of friends or families with kids (see Figure 1). We believe that this distribution of visitors is due to the specific type of museum and the temporary exhibition, La Magnifica Ossesione, on show at the time of the interviews. Figure 1. The museum is predominantly visited by young couples. 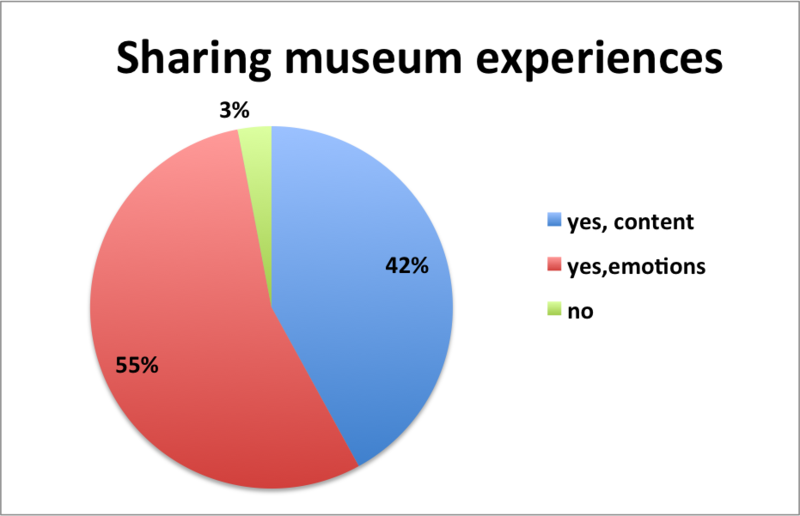 The majority of people interviewed stated that they shared emotions (just telling what they found interesting and how they felt while experiencing objects inside the museum), whereas, the next most interesting thing for the participants to share was content (more details concerning the objects themselves), as shown in Figure 2. Almost one week after the face-to-face interviews inside the museum, we sent a follow-up questionnaire asking people if, how and with whom they shared their museum experience from the exhibition. We sent it to all of the 207 interviewed visitors and we received 62 replies. We found out that around 70% of the visitors who replied shared impressions, and they predominantly shared them only through verbal narration. Even though visitors liked the object, they described them rather than showing them (see Figure 3). Figure 3. 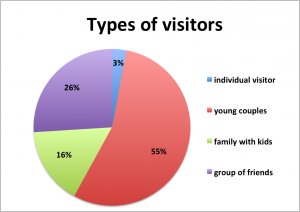 What visitors shared one week after their visit. The study also told us that most of the visitors did not share their emotions on social networks (e.g. 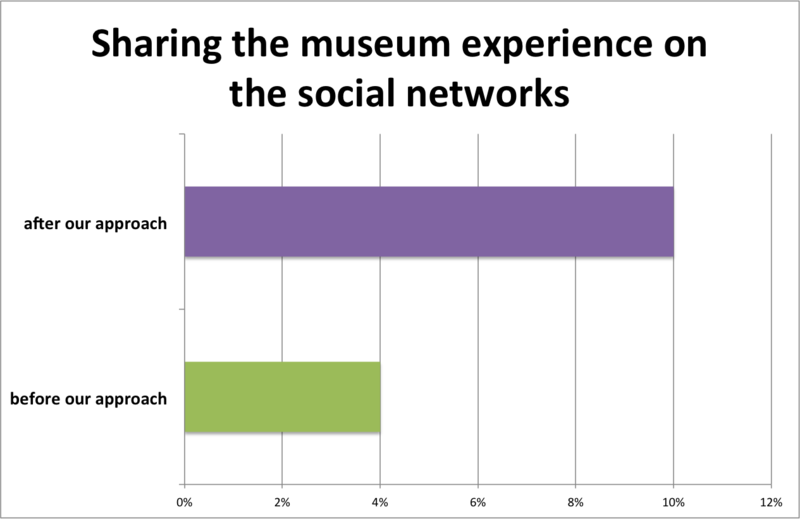 Facebook and Twitter), and that they did not visit the museum’s website after their visits (see Figure 4). Figure 4. 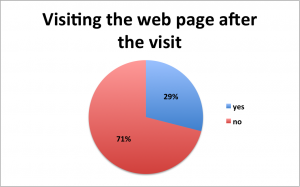 More than 70% of the visitors didn’t visit the museum’s website after their visit. From these results we understood that visitors share emotions originating from their visits, but they don’t use any other materials (like books, leaflets, notes) as a support for storytelling. Visual sharing was even less possible since the museum does not allow photography. There’s motivation and the intention to share museum experiences, but given the lack of technology for this, and that the effort cost of sharing is too high, real sharing rates are low. These results suggest that the vast amount of information presented in the museum is interesting for visitors, however taking into account that the visitor’s time and use of social systems is limited, it is difficult for them to share even though there is the desire for this. We worked on the premise that if we could provide a technological solution that is simple and non-intrusive in the same time, it can potentially increase sharing of the museum visit. We developed a system where visitors can select their favorite objects and customize them using a kiosk interface positioned inside the museum, and email them home in the form of a digital booklet containing more detailed information about the selected objects. It can be used for one’s own cultural enlightenment or as a means of storytelling for people who cannot physically come to the museum. This can be done at the end of the visit, so it is non-intrusive and it only takes a minute. More than 500 booklets were created in only 3 days. The visitors were more than interested in having a virtual reminder of their visit (e.g., http://comealong.me/storyteller/#/86i8vqt7ve). 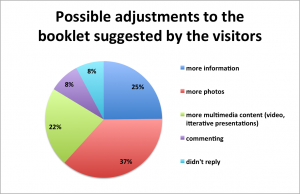 The booklets were accessed by more than 52% of the visitors, and around 20% of the visitors opened the photobook more than once (Figure 5). This suggested that visitors were interested in consulting the booklet more than once and in showing it to other non-visitors. Figure 5. 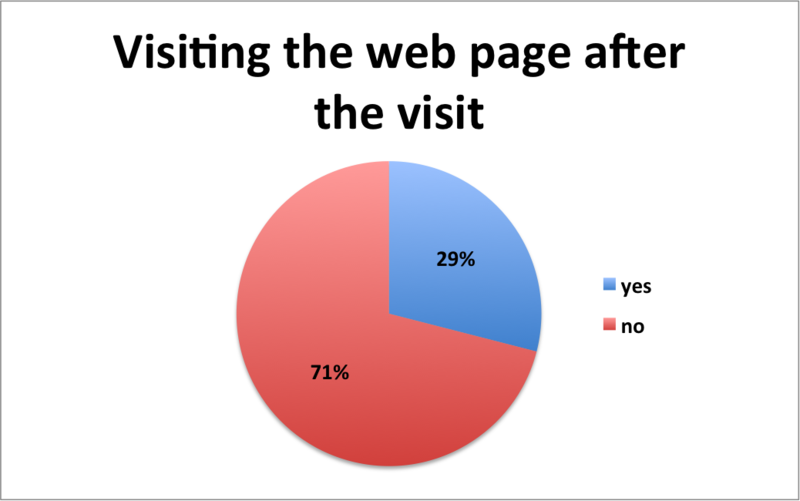 52% opened and browsed the virtual booklet of their visit and more than 20% opened the booklet more than once. 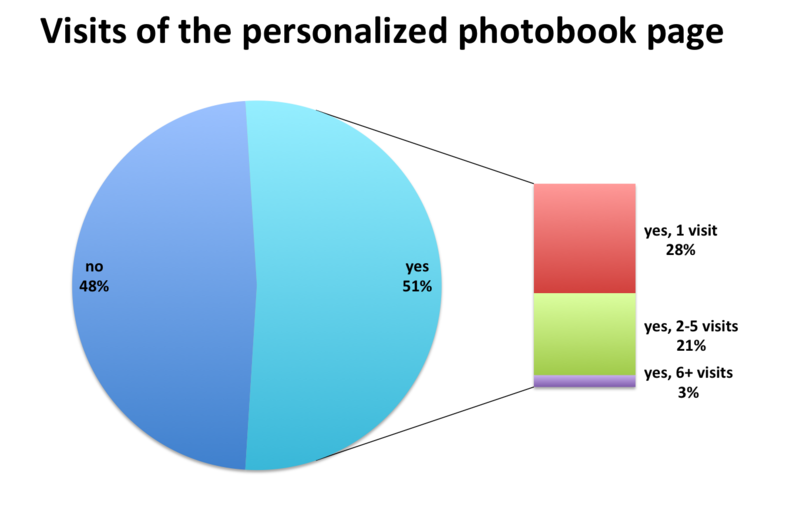 One more time, one week after we tested our technical solution, we sent an email questionnaire, asking the participants whether and with whom they shared the photobook. We sent it to the 500 visitors who had created a booklet, regardless of whether they had accessed their photobook or not and we received 120 responses. 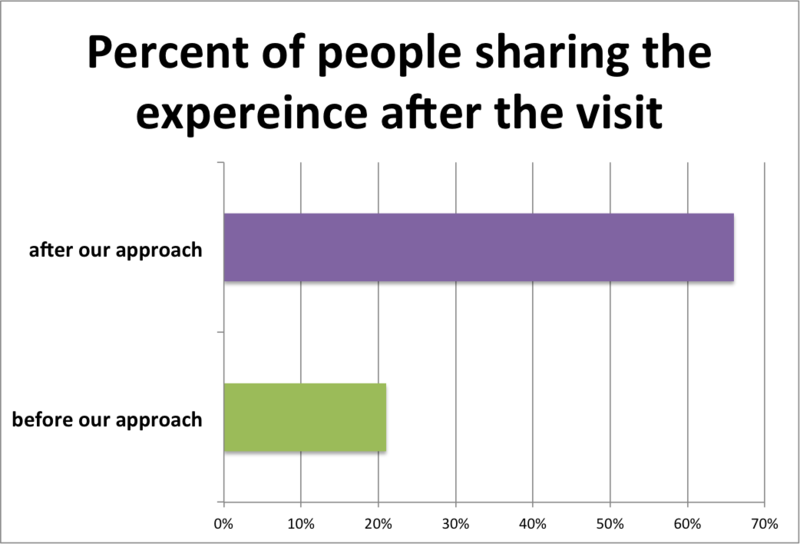 With our approach, the sharing of content from museum visits nearly tripled compared to the sharing rates the visitors reported one week after the museum visit in the absence of technology supplied by the museum to support sharing (the follow-up questionnaire phase in the ‘Investigation of sharing habits’ phase) (Figure 6). Sharing on social networks was twice the earlier amount (Figure 7). Figure 6. Overall sharing of the museum experiences jumped from 21% to 66% with the introduction of our approach. Figure 7. Sharing on social networks went from being only 4% in the follow-up questionnaire to 10% after the introduction of our approach. More than half of responders shared their personalised photobook (see Figure 8). Out of these, 34% showed the booklet to others using their own personal computer (i.e. used it as a resource for storytelling), 22% sent it via email, and 10% shared the booklet on social networks (Facebook, Twitter or Google+). This study also revealed several ways in which the booklet can be improved: more photos (37%), more detailed information in the photobook (25%), additional multimedia material (22%) (see Figure 9). Since we wanted to test our solution with elderly and cognitively impaired adults in the next phase, we also asked the visitors whether they shared the booklet with relatives aged above 70; 8% of the responders did share with relatives over 70 and the most common reason for not sharing the booklet with this category is either lack of time or non-use of social platforms in general. Figure 8. Half of the participants who shared the museum experience with the help of the booklet showed it to others using their own personal computer (used it as a resource for storytelling); 22% of them sent it via email, and 10% shared the booklet on their social networks (Facebook, Twitter or Google+). Figure 9. 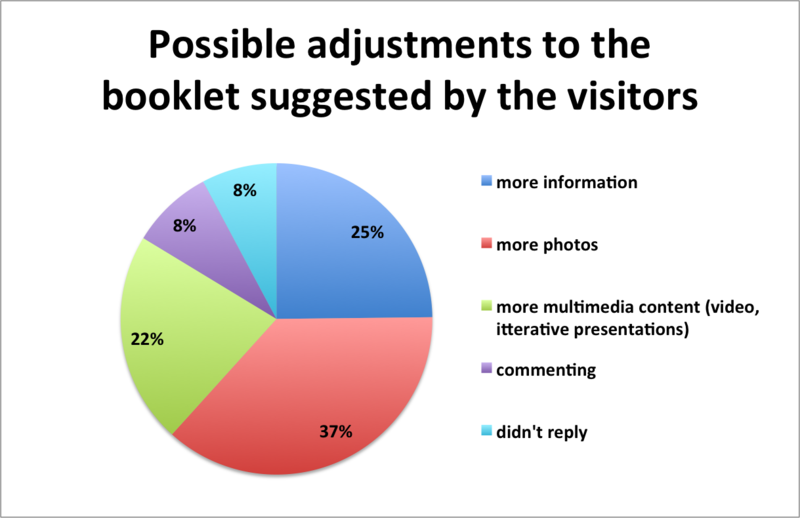 Visitors stated that their general experience would have been better if the booklet contained more photos (37%), more detailed information in the photo book (25%), and additional multimedia material (22%); 8% of the visitors found commenting an appealing feature, whereas another 8% decided to skip answering this question. Older adults experience difficulties while using technology mainly because hardware and software have not been designed to suit them, and the language the technology speaks to them is unfamiliar and outside of their culture (Leonardi et. al, 2008). Taking this into account, we decided to design an interface design for elderly people that is based on familiarity, and we investigated how to translate everyday familiar interaction metaphors into an application interface. After applying several changes to the interaction design, we developed a version more suited for elders and people with disabilities. We started with the idea to have several iterations over the initial design of the booklet in order to adapt it for older adults. We were exploring different ways to communicate that interactive elements on the screen are interactive elements, how to make their design as simple as possible, and we investigated different ways of navigating the content. We performed a pre-user study where we tested the booklet with four older adult participants and the results showed that there were still some minor challenges: how to continue reading after the initial introductory text provided just below the painting (whether the ‘Read All’ feature is just a label or a button at the same time), or how to close the module once a painting has been zoomed in. Because of its general high acceptance by older adults, we decided to use the iPad as a platform. The final look of the booklet, adapted for all users after the last design process iteration. We recruited 30 older adult participants: 21 in a care home (10 of which with significant cognitive decline), and 9 participants in the daily center (all of them without any critical physical or cognitive decline). Only two participants reported any computer use, while in total 4 older adults reported daily use of cell phones. Almost all of the participants had never or almost never used touchscreen devices. The group of cognitively impaired people included people who have an index of mini–mental state examination (MMSE) or Folstein test (a 30-point questionnaire that is used to screen for cognitive impairment) below 25. The participants in our study had a MMSE score around 14, which classifies them as patients with moderate cognitive impairment. This kind of visitor to museums is usually provided little information and interpretation of the objects, and usually is required to book in advance in order to be able to visit the museum. The variety of traveling they do is limited and usually this category ventures to the same set of places with the same people. Moreover, the majority of trips that they take tend to be with assistance. The experience was divided in two segments: a workshop and an actual evaluation. Given that the majority of the participants didn’t have experience using technology, we decided to organize a workshop in order to familiarize the participants with the technology, and we explained to them how to use and interact with an iPad. In the workshop we explained the concept of the home page; the list of icons, each of which performed a different function; and for an hour and a half, we explained to the participants how to use the different basic applications offered by the iPad and how they work. The usability evaluation took place one week after the introductory workshop. Each session was of a duration of 20 mins. The content of the booklet was explained to the participants and they were guided task-by-task by a researcher. During the testing, we observed several forms of bias that can be attributed mainly to the testing environment and experimental limitations. The samples were relatively small and the group of cognitively impaired participants was smaller than the group with no impairments. Since participation in the testing was on a voluntary basis, we noted that the results may tend to represent the older adult participants with a stronger will to use technology in general. We were working on the assumption that people will access the application from home, so some level of familiarity with the iPad will be there in the target usage scenario. We did not perform an evaluation for users that had not been trained to use the iPad in a workshop setting because we wanted to test the impact of the booklet on everyday users of the iPad, who are already familiar with the basic functions of the iPad. Given that participants did not have previous experience using this technology, we had to perform an introductory workshop on using the iPad. We also noted the possibility of a human factor bias: that is, some of the tasks might have been improperly worded or explained by the researchers and this in some way could have led to mis-performance of a task of the participants. However, we believe that the results presented can be seen as a good proxy for the actual acceptance of the booklet by older adults with or without cognitive impairments. To start the test, the participants were asked to press/tap our application icon on the home screen. While older adults without impairments had quite a high performance rate, the degree of successful task performance for the group of cognitively impaired people was only 30% (see Figure 11). Among the most common reasons for this low task performance were: difficulties in having the right sensitivity in touching the screen, i.e the tap is too long (and thus entered the participant into an edit mood on the iPad), or their hands shook so they were not able to tap correctly. From the usability perspective, the difficulty of this task can be attributed to the required precision for the tap-and-release interaction mode and the lack of feedback when pressing. Figure 11. Participants without impairments found this task easy to perform, while people with cognitive disabilities had difficulties with precision and sensitivity for the tap-and-release interaction mode. The next task was to ask the participants to navigate through the booklet at least up to page 3. ‘Browse the booklet’ was a task that required the same physical hand movement as browsing a physical book. 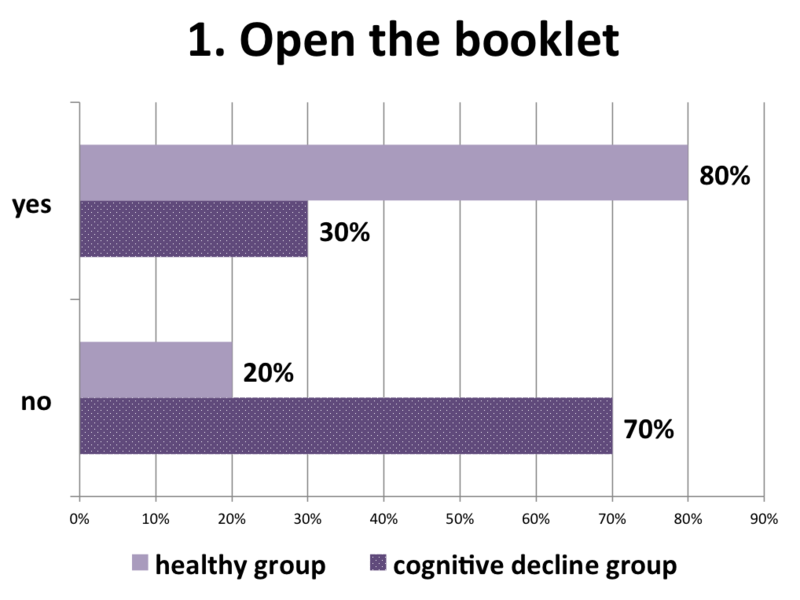 In this task, again the older adults outperformed the ones with cognitive disabilities; however, this time, the task completion rate for people with cognitively impairments was 50% (see Figure 12), which was significantly higher than the completion rate for ‘Open the booklet’ task for instance for this group (Figure 11). What these results suggest is that the gesture performance depends on its similarity with the physical gesture used for an everyday task. Figure 12. Older adults performed better than people with cognitively impairments, however there’s a significant difference in the performance of this task in comparison with other tasks for the cognitively-impaired visitor. The zoom in function of the picture required the participants to tap on the picture in order to open it in a zoomed in mode. In contrast to the ‘Open the booklet’ task where the participants were able to mis-perform it by just pressing the icon for a long time (thus entering the edit mode of the iPad), in this case the interaction was associated with the correct completion of the task. However, the performance rates were again lower than the task performance rates for the ‘Browse the booklet’ task (50% vs. 40%). Our assumption is that since the implementation of the zoom-in feature did not suggested any familiar concept (it’s not natural to press a picture), it represented a problem to the group with cognitive challenges. There is one challenge we faced with this task: people with cognitive loss were prone to forget how to perform it. Even though we reminded the participants how to perform the task, after 5 mins the participants were having difficulties recalling how to perform it, even though they were able to perform it well. Our assumption is that it was not intuitive enough and that it did not follow the natural way in which a booklet can be used. Figure 13. 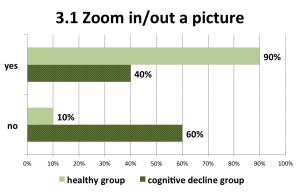 The zoom feature did not suggested any interaction similar to browsing a physical book, and was difficult for the users with cognitive decline decline. For this task, we asked the participants to close the modal window that was open after the painting has been zoomed-in on by pressing a ‘close’ button (X). This option was not evident to both groups, and also required more precision when tapping. As in the previous task, the participants with cognitive decline were slower in recalling the steps to perform the task correctly; although this function required higher recall on the steps to be performed, there was no significant difference in the performance rates between this and the rest of the tasks. Figure 14. The performance degree for the healthy group remained 70% (although this was a task that required a higher recall on how to perform it), and the cognitive decline group remained with low performance rate on this task too. The results told us that when we develop technologies for wide acceptance and use by diverse groups of older adults, more attention should be paid to employing the right physical world metaphors, and especially to the modalities for interaction between the user and the technology and how they are affected by the context and the abilities of each individual user. 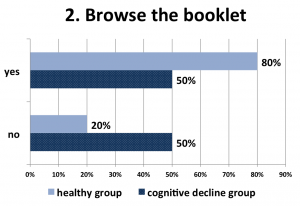 The study revealed that the traditional ‘browsing the booklet’ metaphor was found to be easy to use and was well accepted by older adults. 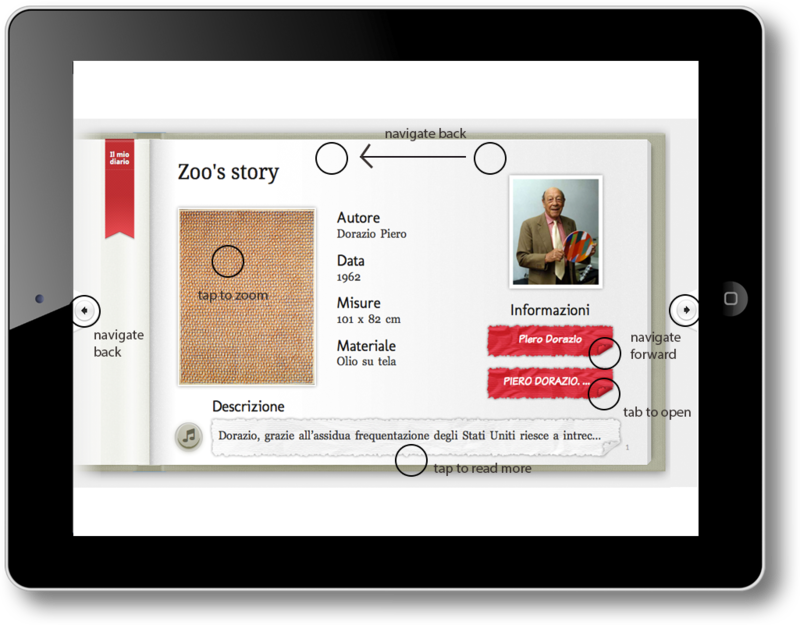 More research is needed in order to understand how can we embed more complex functions (like reading additional info and making zooming-in and out more intuitive), into the booklet interaction paradigm, and further analysis of user satisfaction with sharing museum experiences through the booklet is required. In the direction of using metaphors for interaction, we’re exploring the use of dramas and interactive stories, sometimes in the form of a mystery and requiring investigation. Museums in Trento are piloting games through which small groups of visitors (e.g., a group of friends) are taken through a small narrative when visiting the museums to increase their enjoyment and stimulate interaction. In the next stage we are also examining how to involve elderly people from home in the narrative in a way that their contribution is important to solving the mystery and they are able to communicate their contribution through an effective design. Thus, they would not only participate in the experience but also feel that they contributed to the story. We performed an ethnographic study within the new Renzo Piano museum in Trento, MUSE (Natural Science Museum), and at the moment we are summing up the findings in terms of which interactions and which metaphors have been found to be more fitting depending on the cognitive ability of the users and their living environment (whether at home or in an assisted structure). 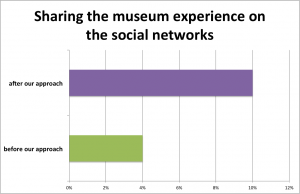 The current platforms for sharing museum experiences are predominantly high-tech Web-based systems. They are easy to use and understandable for children and young adults; however, when it comes to older adults who experience changes in their perceptual, motor and cognitive capabilities, this kind of system may not be the best choice. 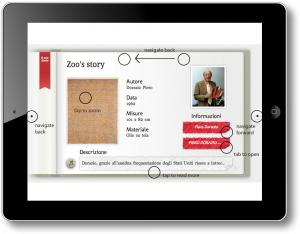 In this paper, we presented the design process and the results of the preliminary study of a novel ‘booklet’ interface: an interface physically and functionally similar to a real-world book, allowing the museum experience to be shared and relived with older adults. Knowing that for a large part of the older adult population technology is perceived as unfamiliar (Leonardi et. al, 2008), and that books are a very familiar concept for them (allowing knowledge to be organized and structured in an understandable manner for them), we decided to use the ‘booklet’ metaphor as a way to communicate the museum experience with this category. 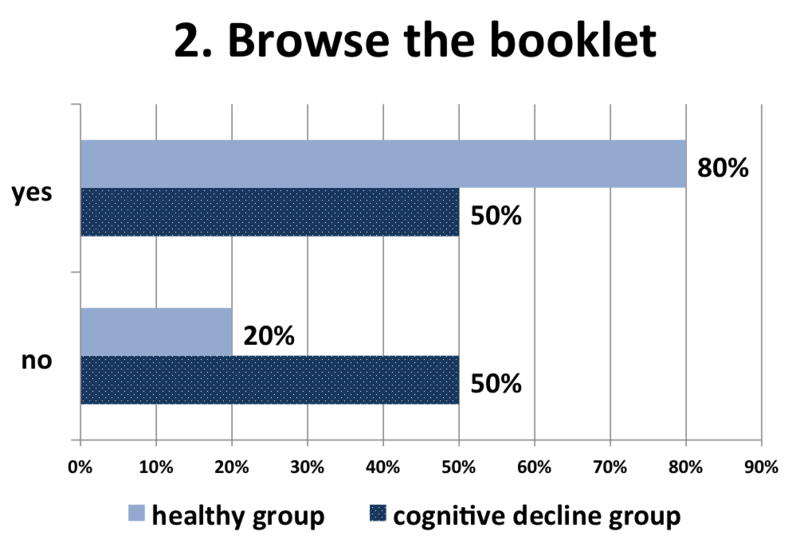 The results from this study showed that the booklet interface did reduce the performance gap between older adults without and older adults with cognitive decline. Our design enabled older adults, including those with cognitive declines, to consume content easily. 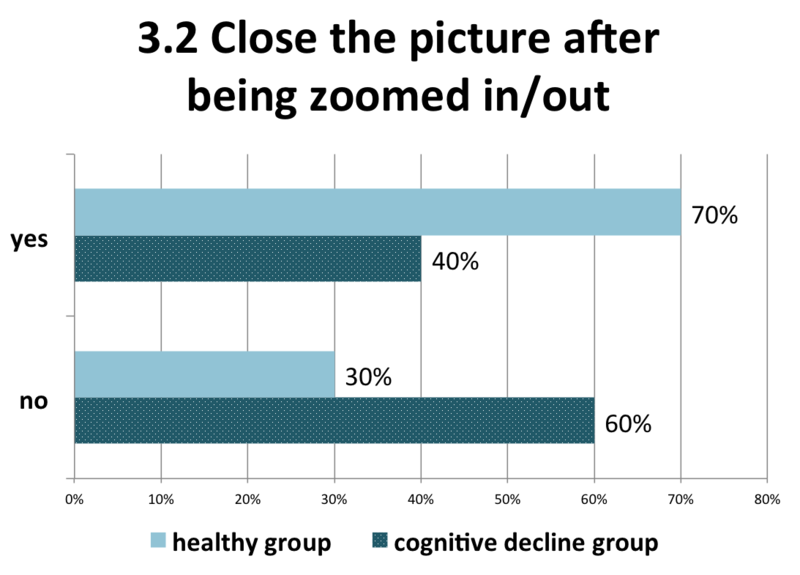 Across four different tasks, 16 out of 20 healthy participants were able to consume and enjoy the content (using arrows or just swiping), and five out of ten cognitively-impaired participants were able to swipe and read the content. The book metaphor was really well accepted by almost all of the users. This came as a positive result taking into account that the participants were using technology for the first time. 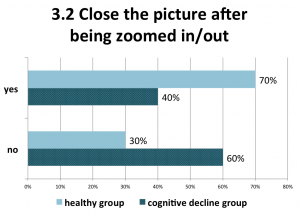 Interestingly, functions like selecting an image, or zooming in and/or out of a picture, were found to be problematic for these participants. We argue that this is due to the fact that in those cases the traditional book navigation metaphor was broken. Even in this case, booklets proved a useful tool when consumed together with relatives who accompanied participants to the museum: that is, as an easy way to support storytelling by providing companion content. These findings expand the previous work showing similar tradeoffs between the digital and analogue design approaches for interfaces (Garrett, 2010). Future work is needed to examine further metaphors, their effect on intergenerational communication, which metrics can be used for evaluating their effectiveness, and the process of designing them. Finally, while task completion is only one aspect of overall usability, it is a fundamental and critical aspect for the final product adoption. Our findings strengthen the case that metaphor interfaces are easy to use for older adults. We thank care home “Tobliners”, Malcesine, Italy and especially Olimpia Cascia for unlimited support during the evaluation. We also would like to thank the daily center for older adults within cooperative Sad, Trento and Katja Wolf for their availability. Thank you Beatrice Valeri, Denise Fezzi, Endrit Bajo, Davide Rossi, Cristhian Parra, Jorge Saldivar for your availability and help with the usability evaluation with older adults. This work was partly sponsored by the TrentoRISE project PerTe. Coleman, G. W., Gibson, L., Hanson, V. L., Bobrowicz, A., & McKay, A. (2010). Engaging the disengaged: how do we design technology for digitally excluded older adults?. In Proceedings of the 8th ACM Conference on Designing Interactive Systems (pp. 175-178). ACM. Fisk, A. D., Rogers, W. A., Charness, N., Czaja, S. J., & Sharit, J. (2009). Designing for older adults: Principles and creative human factors approaches. CRC press. Hornecker, E., and Stifter, M. (2006). “Learning from interactive museum installations about interaction design for public settings”. In Proceedings of the 18th Australia conference on Computer-Human Interaction: Design: Activities, Artefacts and Environments (pp. 135-142). ACM. Kurniawan, S. (2006). An exploratory study of how older women use mobile phones. In UbiComp 2006: Ubiquitous Computing (pp. 105-122). Springer Berlin Heidelberg. Vavoula, G., Sharples, M., Rudman, P., Meek, J., and Lonsdale, P. (2009). ”Myartspace: Design and evaluation of support for learning with multimedia phones between classrooms and museums.” Computers & Education, 53(2), pp. 286-299. G. Kostoska, . , D. Fezzi, B. Valeri, M. Baez and . , Sharing museum experiences: an approach adapted for older and cognitively impaired adults. In , N. Proctor & R. Cherry (eds). Silver Spring, MD: Museums and the Web. Published September 30, 2013. Consulted .